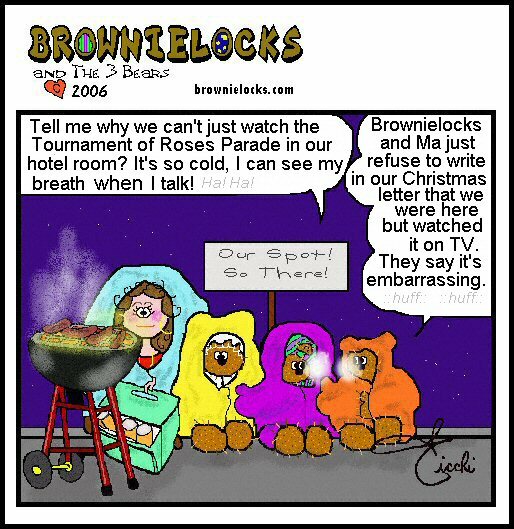 Tournament of Roses Parade History & Cartoon Fun by Brownielocks. The Tournament of Roses Parade is held every year on New Year's Day, unless it lands on a Sunday. Then it is held on Monday, January 2. Why? Some say it's based on a superstition that if it's held on a Sunday, then it will rain on the parade the following year(s). But, the real reason is because way back in the early years , the parade officials were afraid that the noise from the bands would frightened horses that were tethered at nearby churches. The parade that was held on January 2, 2012 was the 18th time in the parade's history that it was held on a Monday. So, being on a Monday doesn't happen very often, but it does happen. Although people were coming out to this Western area, apparently they weren't coming as fast as some people wanted them too? So, in order to promote this "Mediterranean of the West" as they dubbed it, The Valley Hunt Club of Pasadena, CA invited their friends and family from the frozen parts of the United States to vacation there. To help encourage them, they offered entertainment like polo, jousting, footraces, tug-of-war, and even chariot races. Since there was also an abundance of flowers during this season, Valley Hunt Club President, Charles Federick Holder, thought up the idea of also having a Tournament of Roses Parade before all of the other competitions. Besides some local entries, all of the entrants in the competitions would decorate their carriages with flowers too. And, so this is how the first Tournament of Roses parade was started! And, since the beginning, the parade has always had a theme. The theme for the first parade in 1890 was "A Time To Remember." Mr. Holder based The Tournament of Roses on a celebration in Nice, France called The Carnival of Flowers. His original title was "The Battle of the Flowers" because it would be a battle of decorated transportation (surreys, bikes, carriages) all done in flowers. They also had a custom of throwing roses from the vehicles to the crowds along the parade route. How did the title change from "The Battle of the Flowers" to the "Tournament of Roses?" A very popular sport that was played was called the "Tourney of the Rings." This involved horsemen with lances riding at full speed towards a post with a ring hanging on it. The goal was to spear the ring. Mr. Holder suggested that they change the title to Tournament of Roses? And, so this is how the name got started? The first festival had 3,000 in attendance. They came by plane, train, automobile, bike and even airplane later on. They stayed at the most lavish hotels in the area also. Needless to say, in the beginning the Rose Parade was strictly for the upper classes. It grew in popularity each year, and within 5 years (1895) the Valley Hunt Club was too overwhelmed with the responsibility. So, the Tournament of Roses Association then was formed. Although in it's beginning, the parade started with carriages decorated with flowers, we all know it's evolved into so much more than that today. The Tournament of Roses Parade is one very spectacular event. And, so getting a good spot is very important. Starting around noon on December 31st, the streets become fair game for the onlookers to claim their spots and settle in with sleeping bags, barbeques, food, drink, etc. This procedure has become sort of a "Squatter's Rights Ritual" on it's own. The Pasadena Police Department request that one person reserve no more than six seats. So, many organizations send out youth groups to reserve their seats for them. Sleeping on Colorado Blvd. on New Year's Eve for many has become a traditional rite of passage in a way. The official parade route starts from the formation area, then travels north on Orange Grove Boulevard. Then it makes the famous 110 degree turn east onto Colorado Boulevard. Then it travels north again onto Sierra Madre Boulevard. They all began as horse carriages decorated with flowers, and have evolved tremendously with time and technology. Today, it's not just the flowers. It's months of planning, thousands of dollars and thousands of volunteers that are the reason the parade happens every January 1. It all starts a year in advance. First the theme is selected. Then, the Tournament Association invites non-profit groups, civic groups, corporations, and even international groups to apply to be in the parade. There are approximately 35 spots available. Those that want to participate first submit a design to the Association for approval. A float that is oversized or includes more than seven riders or live animals on it, has to have special approval. Once a group gets it's idea approved, then they get a builder who then tries to get a sponsor to fund all the construction. Because some floats can run into the thousands of dollars, the sponsors want to get the most attention for their money. The key? ANIMATION! So, they often hire experts who work in movie animation or special effects fields to help out. Of course, these are all done through computers, which means they also have to hire computer experts. About that stuff.... Well, it's not just flowers anymore. It has to be anything that's organic (fresh, dried, or crushed). Some of the popular items used are spices, seeds, pods, bark and beans from all over the world. Many flowers are used for their colors, with blue being the hardest to find. Another problem is if a flower that has been counted on, suddenly can't be used due to growing problems, shipping problems or cost. If a substitute flower of a close shade can't be found, then many times an entire color design has to be changed on a float. Although each year, many new plants become new items on a float, the primary plants are always flowers. *"It has been said that each float is covered with more flowers than a typical florist uses in five years." Ever wonder why some floats win and some don't? Ever wonder how the judges judge those floats? There are two rounds of judging (a third round only if there is a tie). The judges use a 1-10 scale, with 10 being the best. Some categories have more value than others. Below is a chart that describes the judging scale categories and what they mean. In the beginning, there was one trophy as shown above. Today there are 24 different Tournament of Roses Parade trophies that are awarded to the floats. Below is an alphabetical listing of the trophies and what they are awarded for. Who was the very first Rose Parade queen? She was Hallie Woods in 1905. (There was no queen in prior years.) And, things for Hallie were a whole lot different than they are for the Rose Queen today. First of all, Hallie was chosen by her friends at Pasadena High school. She also had to make her own float and sew her own dress! Then, in 1906 things changed a teensy bit for the Rose Parade queen. She was not elected by friends from her school. Instead, she was voted upon and elected by the Tournament Committee. But, the poor girl still had to make her own float and sew her own dress (sigh). I'm not sure when they stopped making the queen make her own float and sew her own dress, but today we all know that's not the case. Around September, approximately 1,000 girls compete for the crown and/or to be one of the six princesses of the court. Besides riding on the float in the parade, they are also very busy attending over 100 media events during their reign. In 1891, the first band to play in the Rose Bowl Parade was the Monrovia Town Band, probably using wood and calfskin drums. Today the bands are much more refined and have some of the most sophisticated percussion instruments there are; and, creating awesome sounds. There are only 22 bands allowed in the parade. Bands from all over the country compete for the honor of being in the parade and seen by millions worldwide. Selections are done two years in advance. This allows the bands enough time to earn the money to go by having car washes, bake sales, etc. In many communities, raising enough money to send their band to the Rose Bowl Parade includes practically everyone in town. It also gives the band enough time to get in physical shape for the parade. The parade is a 5 1/2 mile march. It can be grueling for some band members, especially those that carry the heavier instruments. And, don't forget the majorettes, flag wavers, etc. who also have to walk all that way as well. In the beginning the parade route was nothing but a dirt road. Horses didn't have a problem going down Orange Grove Avenue onto Colorado Street at all. But, then the road got paved. Today, in order to help the horses deal with marching on pavement, they are shod with horseshoes that have been treated with anti-slip material. And, veterinarians are placed along the route to ensure the horses' safety. And, as I said above, it was due to the horses that the "Never On Sunday" rule started. The Grand Marshal has always been someone who represents goodwill and lifetime achievement. Back in the beginning of the Rose Parade, the Grand Marshal was usually someone who was one of the organizers. The first Grand Marshal who wasn't from the Pasadena area was (San Francisco) Mayor James Rolph in 1930. Then, three years later in 1933, the first female Grand Marshal was actress Mary Pickford. Some people have been Grand Marshal twice. Bob Hope was Grand Marshal of the Rose Parade in 1947 and then later in 1969. Shirley Temple (I believe the youngest Grand Marshal) led the 50th Rose Parade in 1939 and then did it again in 1989 for the tournament's Centennial. There are over 900+ volunteers who donate about 80,000 hours a year whose responsibility is to make sure everything goes right on parade day. Their jobs range from controlling traffic to dealing with public toilets. These volunteers are very noticeable because they all wear white suits. Why white? Rumor has it that it's to be a bit sassy at the Eastern fashion rule that you can't wear white after Labor Day. It also makes them very noticeable in crowds and recognizable as tournament workers. (OK, for the people in charge of toilets, this doesn't seem to practical at all though.) Anyway, it's these white suits that are the source of their nickname, "White Suiters." The origins of the Rose Parade are somewhat upper class. But today, people from all walks of life help out. Their responsibilities start out small and work up to bigger things through the years. They might begin by simply putting up "No Parking Signs" or dealing with all the overnight campers on the streets to perhaps becoming a committee chair and eventually the Board of Director of the Tournament Association. If he or she still wants to help, he could be elected to executive committee (14 members) and perhaps all the way to president! But, you have to be committed. This is rise in rank takes approximately 20-30 years. "America's New Year Celebration. The Rose Parade & Rose Bowl Game"
Note: Sentences with an * before them are direct quotes from the book.